Bury St Edmunds Sea Cadets hosted the area Sea Cadets’ regatta at Lackford Lake on Saturday. 80 Cadets from 7 units across East Anglia were greeted by bright, breezy weather which provided some challenging sailing conditions. Competition took place in three dinghy classes – the two handed Bosun and the singlehanded Pico and Topper. The Bury St Edmunds’ unit fought off strong challenges from the Norwich, Beccles and Ipswich visitors to win the team prize and secure their place in the regional championship, which will be held later this year. Sailing for Bury, Leading Cadet D. Davis crewed by Able Cadet A. Hale won the Bosun class; Cadet O. Hale won the Topper class and Ordinary Cadet S. Davis came runner-up in the Pico class. 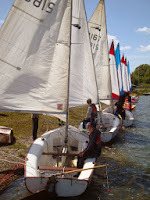 Club racing took place on Sunday and Bank Holiday for the Spring Cup. It was still breezy but with much warmer temperatures than of late, which provided some very pleasant sailing. The first day saw some close racing with different winners in each of the three races. Chris Styles did well in his Comet to notch up his first victory in his new boat. However, it was Debs Steele, showing that she is getting the hang of her Byte CII, who cleaned up on Sunday to win the weekend’s trophy.